You’ve heard the saying, of course — if not from that best-seller called the Bible— than most certainly from The Byrds’ catchy song “Turn! Turn! Turn!” that topped the charts in 1965. “Plenty of traders agree that seasonal trends exist in stocks,” says our trading and penny-stock expert Tim Sykes. Tim should know… If you recall his background, he took a $12,000 grubstake — his bar mitzvah money — and traded his way to $2 million. As if that’s not impressive enough, he did this during the 2000–02 dot-com bust. So yeah, Tim knows a little something about the cyclical nature of stocks. “Stocks can follow a variety of different cycles,” says Tim. The same goes for companies — demand waxes and wanes, affecting profitability — and that’s what investors should be keyed into. “As an investor, you could potentially look at these seasonal trends and stand to gain from taking advantage of the resulting rise and fall of a stock,” Tim says. Seasonal stocks: “These stocks are characterized by a demand at different times of the year,”Tim says. “For instance, a company specializing in bathing suits is probably not as active during the fall and winter months but may enjoy surges in the spring (when swimming attire debuts in stores) and throughout the summer,” Tim says. Instead of bathing suits, think T-shirts. Sure, they might sell more in warm-weather months, but they really sell year-round. Cyclical stocks: “These are the types of stocks that follow the general trajectory of the economy,”Tim says. And investors should pay attention: These companies also can be among the first indicators of a market boom… or bust. Noncyclical stocks: Unlike a cyclical stock, a noncyclical stock won’t be as strongly affected by turns in the economy. Think of companies that manufacture pantry/medicine-cabinet staples: “The demand for these items won’t be altered by the economy,” Tim says, “because they attend to basic needs. In addition: “There are a few reliable stock market trends you can consider when thinking about seasonal stocks,” Tim says. “You’ll often see stock prices rise in times directly preceding seasonal occasions,” Tim says. “For instance, right before Thanksgiving, Christmas, the Fourth of July and so on. Tim says: “Examining stock market trends and the seasonality of different stocks can help you create a stronger plan of attack when planning trades. “Each bar… indicate[s] a buy and sell date based upon the optimal holding period for each market sector,” according to website Equity Clock. We think that’s a rhetorical question… heh. “You can… often gauge certain sectors that might have more seasonality than others,” says Tim. 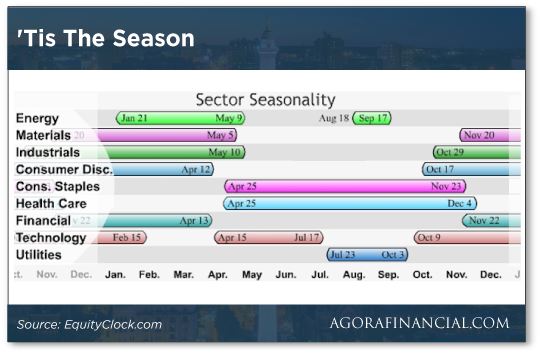 “For instance, oil, retail, health care and banking are just a few of the industries in which you can notice seasonal trends. “However,” Tim warns, “don’t fall into the trap of thinking that seasonality is a done deal. You can never know for sure how a stock will perform because the market constantly changes. [Ed. note: To that end, Tim’s inviting you to a one-of-a-kind interview with Larry King. The two will share details about a brand-new way to collect income and potentially overcome their retirement issues. And in case you’re wondering, there are no options… strictly stock trades. So, as a valued reader, we urge you to reserve your spot for this exclusive sit-down… which will be privately broadcast Wednesday, Dec. 12, at exactly 1 p.m. EST. Click here now to learn more and reserve your spot. You won’t want to miss it! At one point yesterday, the Dow was 475 points in the red, only to end the day slightly in the green. Today, it jumped 350 points only to give it all back — now resting at 24,405. By yesterday’s close, the S&P 500 pulled back above the 2,600 “line in the sand” identified by Greg Guenthner — averting the dreaded “correction” territory of a 10% drop from the S&P’s September record. Right now it’s holding at 2,640. The Nasdaq’s added 19 points at 7,039.6. Oil’s up 72 cents, to $51.72 for a barrel of West Texas crude. The yellow metal is down — meh — just 10 cents, to $1,249.30 per ounce. And bitcoin is down $61.75, to $3,342.45. “The stock market hasn’t been kind to the bulls this winter,” says our Alan Knuckman from the trading pits at the CBOE. “This chart pattern occurs when a security’s 50-day moving average (DMA) crosses below its 200-DMA — and both averages are in decline. “The pattern gets its ‘deadly’ moniker because some investors claim that when we see one, it spells doom for the asset in question.” Or the market at large… gulp. According to Bespoke Investment Group, there have been 12 S&P “death crosses” since 1929. Granted, market returns have been historically negative in the month following the moving-average cross. However, three months post-death cross? “The S&P averages a gain of 3.5% — and the index is positive 75% of the time,” Alan says. We’ve seen four death crosses since 2010 and — every time — the market showed positive returns three months after. “In addition, the broad market gains an average of 7.5% in the six months following the appearance of a death cross,” says Alan, “and it’s positive a whopping 83% over that span. “The post-death cross six-month return is nearly double the average six-month return of the S&P 500 over all other periods. In fact, Alan sees signs of stocks’ turnaround: “In each of the last three sell-offs since September, the S&P has tested — and held — at the key support level of 2,600. “That level represents the lower bound of the index’s three-month range (2,600–2,800),” Alan says. Retirement and income specialist Mike Burnick wonders if Santa Claus (rally) is comin’ to town. “Over the past 30 years,” he says, “global stocks have gained an average of 2% during the month of December. “There is one place investors have been able to seek some refuge from turbulent market conditions,” says Mike: “High-quality defensive stocks. So what are the best stocks to own going into 2019? In today’s market environment — with interest rates and volatility on the rise — Mike recommends these sectors: technology, consumer staples, health care and industrial. 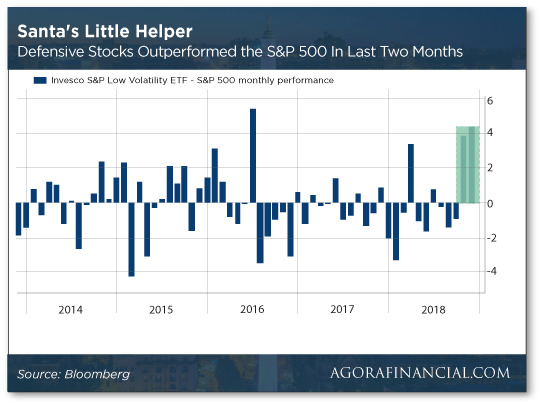 If you’re looking for an easy way to take advantage of these sectors, look no further than the Invesco S&P 500 Quality ETF (SPHQ). “This ETF has 72% of its assets invested in technology, consumer staples, health care and industrial shares,” says Mike. This is weird: “For one day only you can get chocolate coins from a cash machine outside Tate Modern,” says an article at Londonist. To be sure, it’s a lump of chocolate coal, so a win-win wager, we’d say. And just how’s your status — naughty or nice — determined? In fact, you can check your status before your visit to the Tate here. Did you catch whose Twitter handle’s used as an example? For the record — and the sake of hard-hitting journalism — we had to check out the president’s status. But — for the life of us — we can’t decide how to file this story: The War on Cash? The War on Privacy? It’s a coin toss… heh. P.S. Need to play catch-up on your retirement savings? If that’s the case, view this important live event hosted by legendary commentator Larry King. In this exclusive interview, America’s No. 1 trader will reveal a moneymaking strategy that can show you how to walk away with the potential to add thousands to your nest egg. In as little as a single day. The best part: The event is absolutely free and you can watch from the comfort of your own home. View all the details here… But hurry, because space is limited and it’s happening TOMORROW, live at 1 p.m. EST.